Retrospect Backup 15.6 supports Apple macOS Mojave (10.14). macOS Mojave (10.14) introduced a new security feature to help users manage their data privacy: Privacy for "Application Data". This additional protection ensures you know exacty which applications have access to your data by requiring explicit consent for file-level access to certain application data folders, like Mail, Messages, and Safari, so Retrospect Backup engine and client will not be able to access the entire system without explicit user action. Follow our step-by-step guide to allow Retrospect Backup to continue protecting your Mac environment. With Retrospect Backup 15.6, there are no additional steps for upgrading. Please follow the steps below after the upgrade is complete. 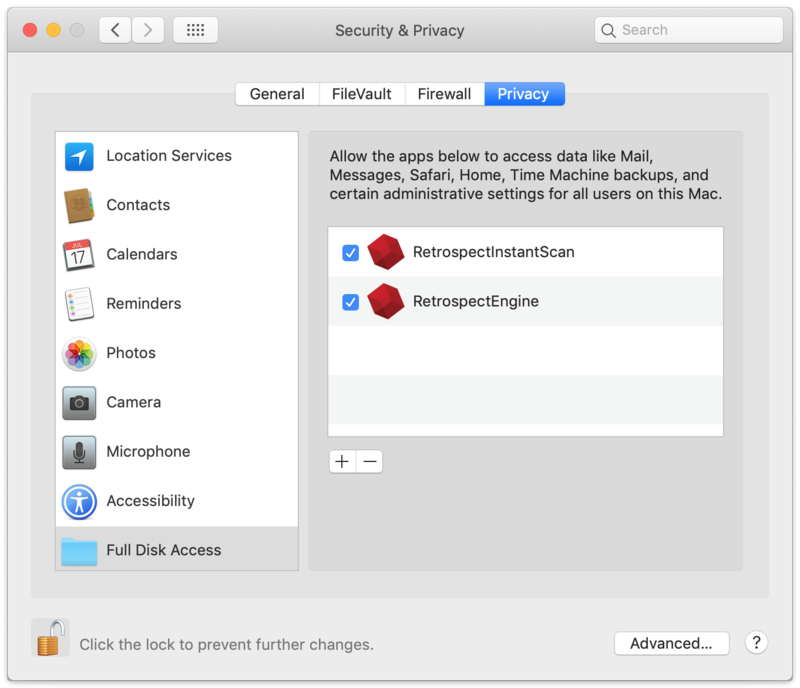 Retrospect needs to be listed under System Preferences > Security & Privacy > Privacy > Full Disk Access. This applies to both a local Retrospect engine and a remote Retrospect Client application. Open "System Preferences" under the Apple at the top left of your screen. Click on "Security & Privacy" then "Privacy". You should see "Full Disk Access". Click on the lock to authenticate and allow changes. Scroll down "RetrospectEngine" and "RetrospectInstantScan" and drag them into the "Full Disk Access" list. Close "System Preferences". Scroll down "Retrospect Client" (from the first folder) and "RetrospectInstantScan" (from the second folder) and drag them into the "Full Disk Access" list. Close "System Preferences". "Retrospect has detected it is not listed under "Full Disk Access" on the backup source system and cannot access all user data to create a complete backup. Please follow our step-by-step guide: https://www.retrospect.com/kb/macos_full_disk_access."